Put together the most well rounded circus in time for the grand gala and form valuable trios in the meantime. Your audience demands it. Don’t let them down! 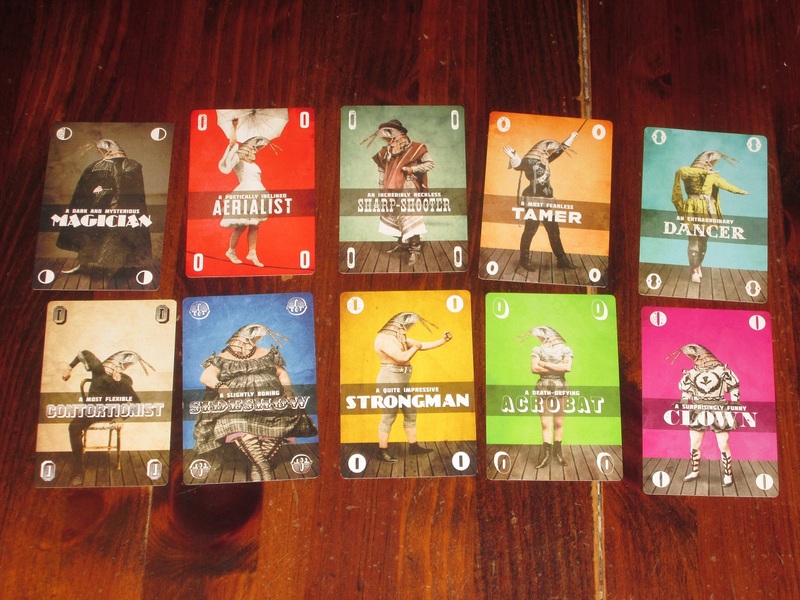 Circus Flohcati is a press-your-luck set collection game for two to five players. Players compete to collect the best acts for their flea circuses, putting together trios and solo acts. The player with the most valuable circus at the end of the game wins. Circus Flohcati set up. … Yes, you just shuffle the deck and put it on the table. 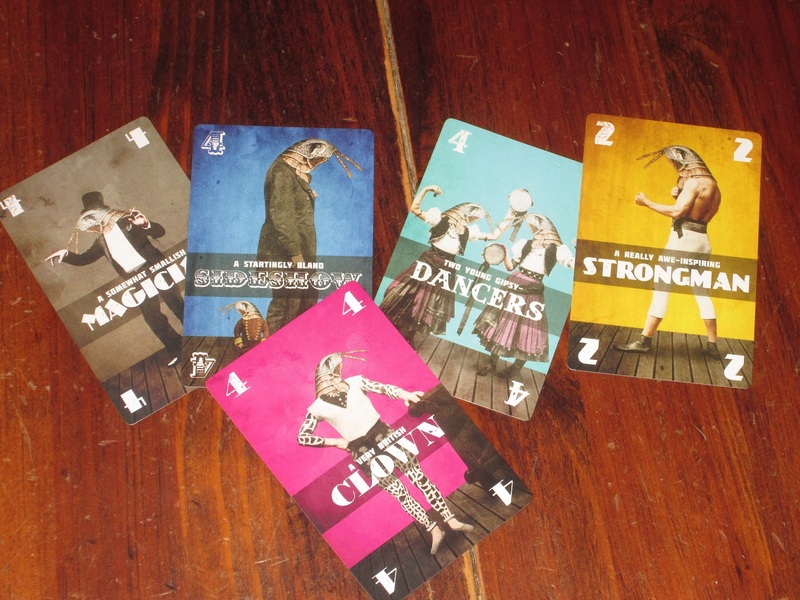 To begin, players shuffle the deck of circus acts and action cards. There are ten different circus acts, numbered 0-7. On a turn, the active player may turn up as many cards as desired. However, if a card matching the suit of an already visible act is turned up, this card is discarded and the active player gets nothing. If the player doesn’t lose the turn, he or she chooses one card from the face-up cards. Then the player may play any trios, sets of three of the same number. There are special action cards, which when revealed from the deck force the active player to get cards in different ways (either from opponents or by increasing the available supply of face-up cards). The rulebook is quite small and super easy to explain. 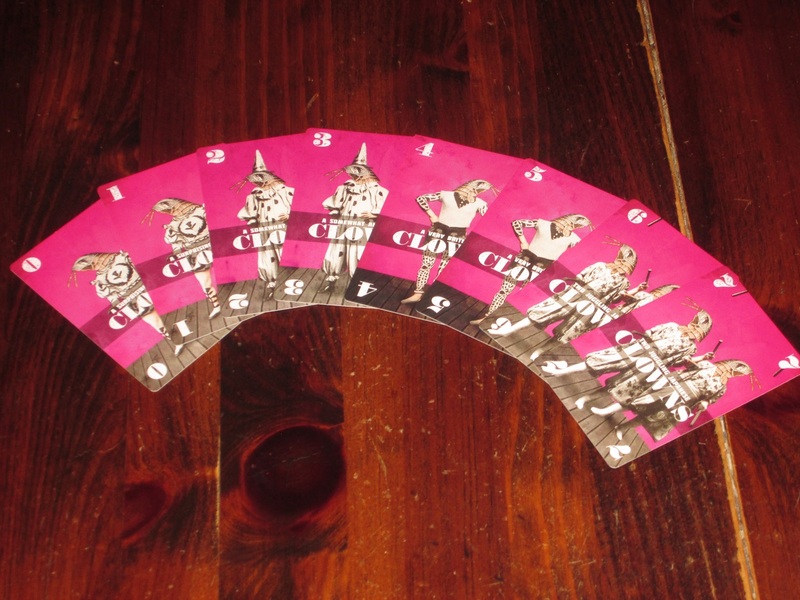 The game ends when either the deck runs out or one player calls a gala (when that player has at least one card from each of the ten circus acts). Players score their most valuable card in each act, plus 10 points for each trio and 10 points if they called the gala. The player with the most points wins. 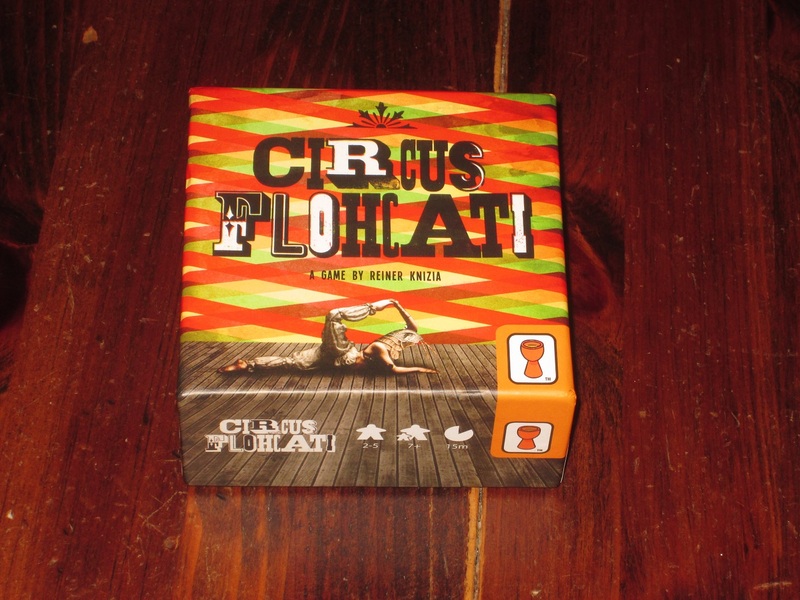 Circus Flohcati is a reprint of an older Reiner Knizia game with the same name. And now that I’ve played it, I see exactly why it was ripe for a reprint–it is a top-tier short card game. I love the humanoid flea artwork in this edition of Circus Flohcati. Here are some of my favorite fleas. First, let’s talk about the look, which is probably the most divisive thing about this new edition. Personally, I love it. The humanoid flea artwork is hilarious–the old-timey circus acts with the superimposed flea head (yes, it’s the same head over and over) give this game a distinct character. I was initially worried how my wife and sister would react to this–neither of them is a friend of bugs–but I presented the game without mentioning it. They took just as much delight in the artwork as I did, and I was surprised that my sister didn’t immediately notice what was off in the artwork. (The dawning realization was fun to watch.) Even more than this, we got a kick out of the captions for each card. “A very British clown.” “A startlingly bland sideshow.” All of this serves to create an expectant atmosphere around the game that enhances the enjoyment of it. 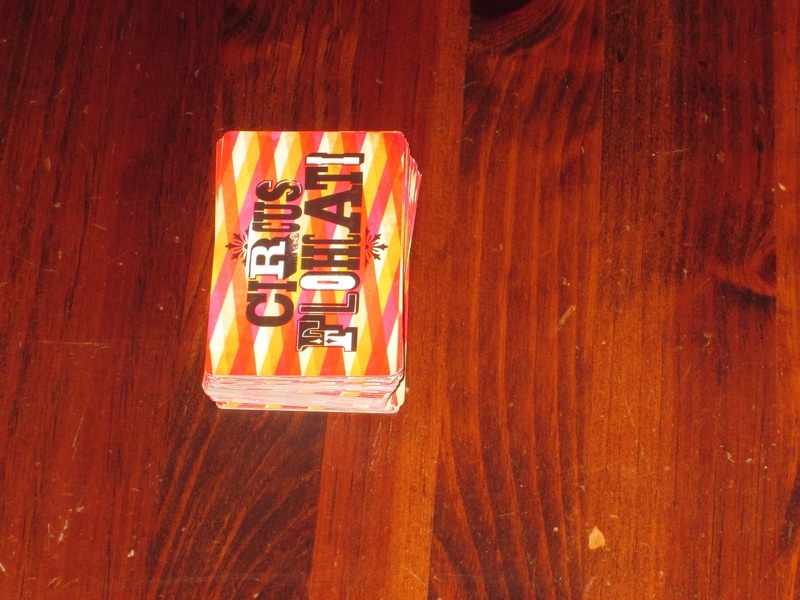 I owned the older, Rio Grande Games edition of Circus Flohcati, and I never played it. The cartoony artwork made it look like a children’s game, and the game looked simplistic more than simple. (More on this in a moment.) I much prefer the look of this new edition, although I can imagine the humanoid fleas will be a bridge too far for some players. Thankfully, I’ve not encountered them in my groups. Here is a card of the same number for each suit. As you can see, the numbers are not the same font. This is a minor annoyance, but not really a deterrent. There is a small flaw in the look, and that’s that the numbers for the suit of each card are a different font. Zee Garcia makes much of this in the Dice Tower review of Circus Flohcati, and while it is a minor annoyance, it’s not that bad from a usability standpoint. Since only one card from each suit can be face-up at a time, it’s pretty clear that the fonts are different, and it’s easy enough to adjust accordingly. And since all cards taken are face-up in the game (even when taken from another player), players can help one another if they can’t make out what the number is supposed to be. Again, it’s a little annoying, but it’s far from being unusable, and I kind of like the different fonts (with the exception of the sideshow suit font, which is a little too ornate). Otherwise, the colors are clear, and I love that the flea artwork is varied within each suit. As I said, the look of the game adds a lot to the atmosphere and elevates my enjoyment of it. The box size is nonstandard, and while I would have preferred a more consistent size for easy sorting, the squat square box isn’t a deal breaker, given how much I enjoy the game. Which brings me to the gameplay. 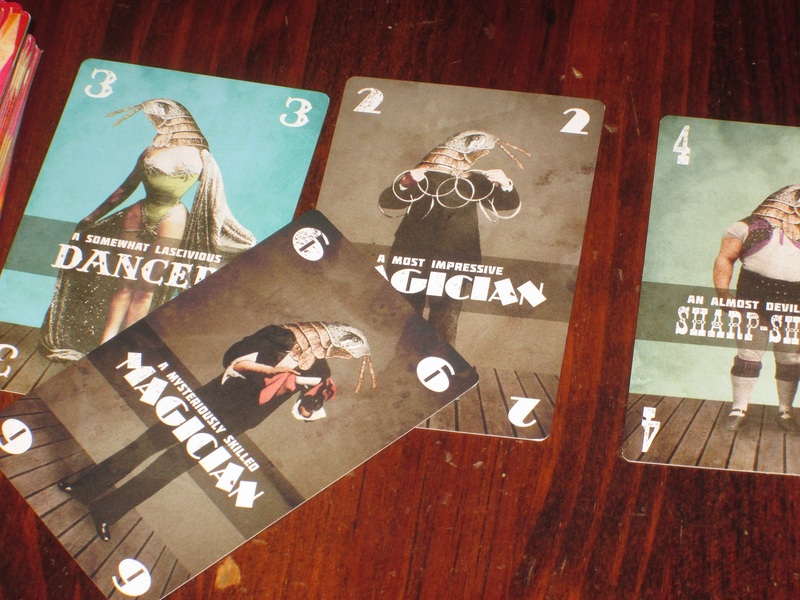 Circus Flohcati is one of the better short card games I’ve played. 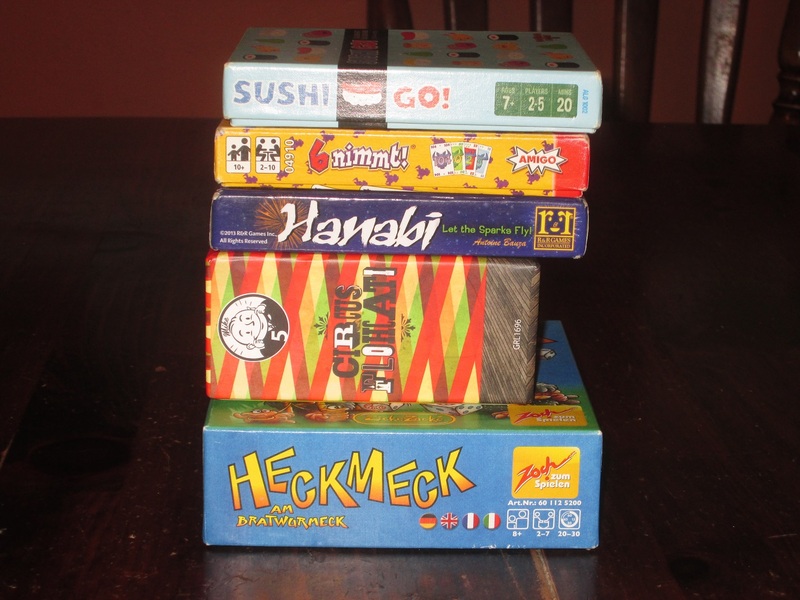 No, this isn’t meant to sustain an entire game night, but it can easily sustain the time it takes for always-late Jeff to arrive or even a full lunch hour. Oh no! A second magician card is revealed, meaning it is discarded and the turn is lost. The reason is that Circus Flohcati is a game with low rules overhead where choices still matter. The game takes a minute or two to understand, and players quickly and easily grasp what it is they’re trying to do. Players usually have two choices each turn: they determine whether they are willing to keep turning cards over (knowing that each one is a risk) and which card from the row they will take. 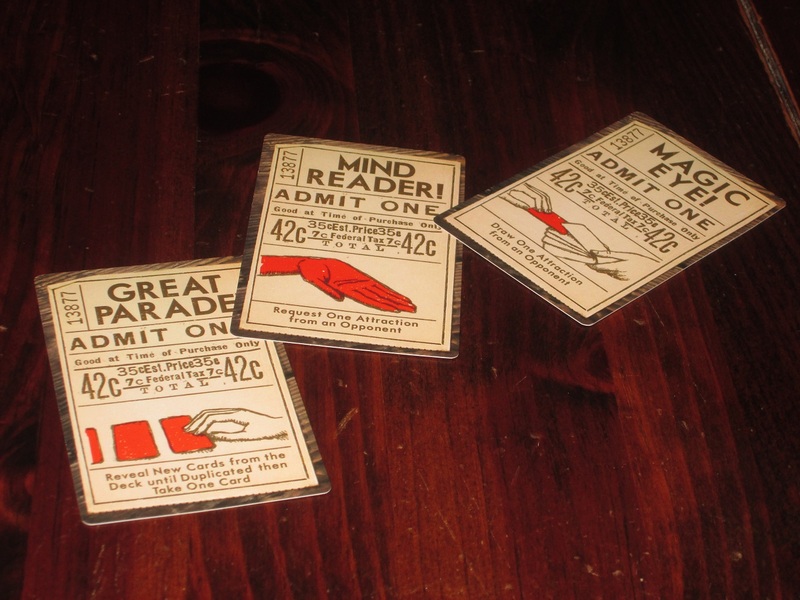 Cards score points in two ways–as trios and as part of the gala at the end of the game. Trio cards are guaranteed points, but only if you collect three of the same number, and they have diminishing returns. That is, if you collect a set of three 0s, you get ten free points. If you collect a set of three 4s, you lose two points on the deal (although there is more that goes into the decision than that). Trios, however, are always safe and cannot fall victim to special action cards. Choosing high-numbered cards is what you obviously want to do, but you might not be able to draw what you want, or these cards can be stolen, or even if you have two high numbers of a suit, you can only score one of them. The decision of which card to take is always interesting but never too grueling: you are only being pulled in two directions. Players must simply prioritize which direction they are going with this particular card draw. 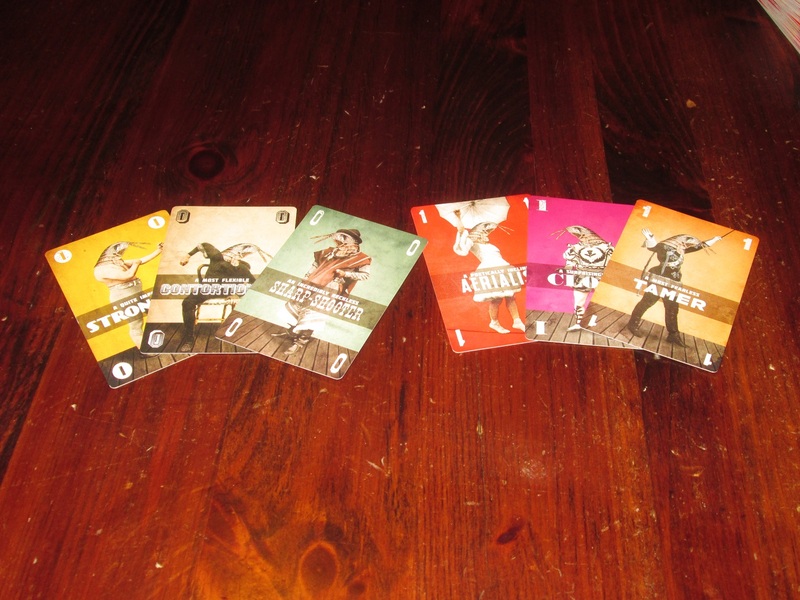 The special action cards help to keep the game interesting. The special action cards keep the game from getting too stale or scripted. They also serve as a natural balance to luck of the draw. Has one player had repeatedly good luck with the deck? He will likely be the target of special attack. Does another player have many trios in front of her? She will likely have her hand cards snatched. All card draws (even secret ones) are public information, so players can track (if they wish) who has what cards. But with ten suits and eight numbers in each suit, it’s usually hard to remember who has what beyond vague generalities. Forming trios makes guaranteed points, but they cost turns to make and have diminishing returns. What makes the game fun for me is the constant tension of pressing your luck. Each turn is exciting. How far will each player press their luck? It’s fun to see even conservative players get burned by the card draw, and it’s even fun to see opponents beat the odds and turn over card after card without duplicate. It’s frustrating and hilarious when card after card that gets turned over from the deck is a clown because everyone refuses to take the 0 clown from the center row. The game fosters the cheers and groans that make risk-taking games fun, and the already silly mood that the card design sets keeps the game light and energetic throughout. Like I said, this is a top-tier short card game. Each suit has eight cards with four different pieces of art. Here’s the clown suit. That’s not to say everyone will like it. While there are choices in Circus Flohcati, there is also a lot of luck. You can play the odds, sure, but odds aren’t guarantees, and sometimes another player will just be luckier, or sometimes players will misjudge whom they should take cards from, or sometimes the other players will let Jimmy get the cards he needs for his trio but not you. You have to accept some level of volatility in this game in order to enjoy it. It’s not a complete take-that free-for-all, but it’s also not a slow-burn strategy game. Circus Flohcati is meant to give you fifteen to twenty minutes of light decision making and laughs, and on this count it succeeds mightily. As long as players don’t go into it expecting something else, they should be pleased with what’s on offer here. The inside of the Circus Flohcati box. Circus Flohcati’s box says the game suits two to five players, and this is accurate. I like it at all of these counts. Surprisingly, the two-player game is still a lot of fun to play, and it is a tense head-to-head competition as you try to collect trios and call the gala before the other player. The game also works with more players. If I were forced to choose an ideal count, I would say I like the three- and four-player game best, but I wouldn’t refuse the game with two or five players. Circus Flohcati is versatile in this way. Circus Flohcati’s box is nonstandard, which is a bummer, but the game is good enough that I will be keeping it anyway, even though it makes storage more difficult. Circus Flohcati is an excellent filler game, one that will likely make it onto my top ten filler games list when I next revise it and one that I’m sad to have missed before now. That being said, I’m grateful for the new edition and love the new look (although, again, if Internet reactions are any indication, the new look is divisive). 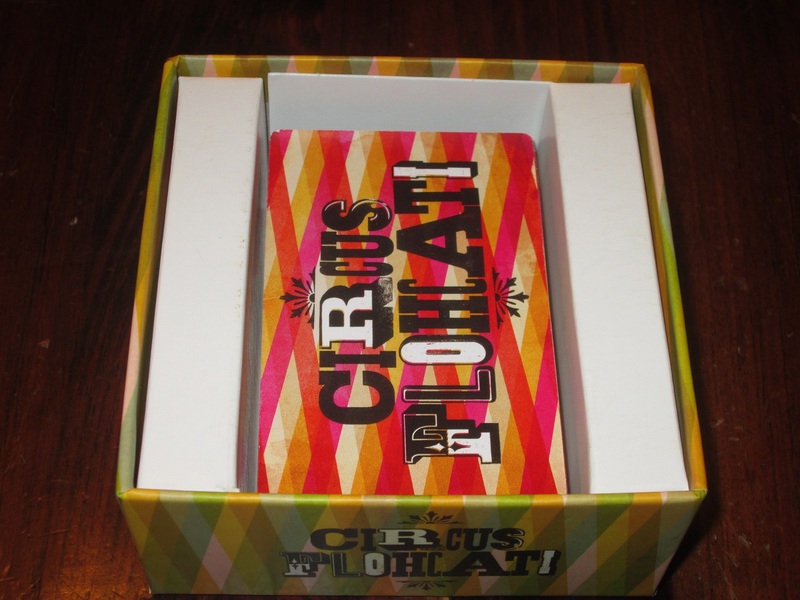 Circus Flohcati perfectly fits its niche and delivers good laughs in a small package in a short playtime. This ensures it will be a constant companion in my backpack for some time to come. 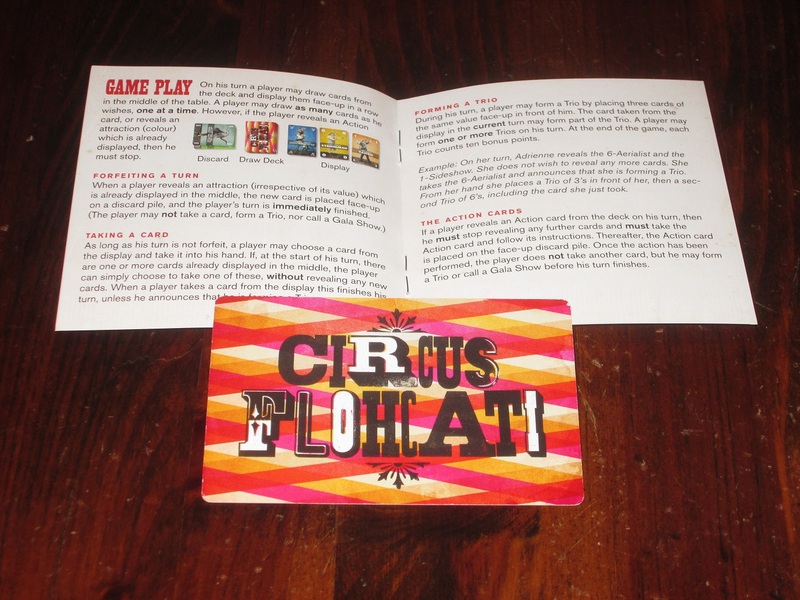 iSlaytheDragon would like to thank Grail Games for providing us with a copy of Circus Flohcati.